In the good old showbusiness tradition, the show will go on for Durban’s Rhumbelow Theatre franchise – but not for a few months at the Umbilo venue, in the shellhole of the same name, in Cunningham Road. Plans for a simple ceiling replacement there, following recent storm damage, have now led to the opening of a whole new can of worms, as it has been discovered that beams in the roof are cracked and pose a danger. It is a process that could take up to six months as a result of financial issues and availability of a work team, says Roland Stansell, manager and entertainment co-ordinator of the Rhumbelow Theatre group, which also has branches at Tina’s Hotel in Kloof and the Allan Wilson shellhole in Pietermaritzburg. 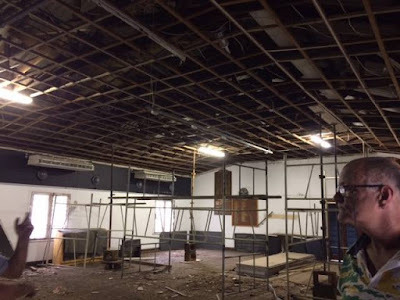 “As far I am concerned the Umbilo building is condemned and it seems highly likely we will have to replace the entire roof to ensure safety,” he adds. Roofing woes will see the Rhumbelow Theatre in Umbilo, Durban, closed for up to six months. A cracked beam was discovered the day after Christmas, when Bryan Hiles, who was project managing the ceiling repairs, arrived with his team to remove all lighting and projectors at the venue for routine cleaning and maintainance. When the damaged ceiling was removed it was noticed that a beam was cracked and there were signs of previous repairs where extra battons had been added. That, however, was done as far back as 1956, says Roland. A day after the cracked beam was noticed, a representative of the repair team noticed three fresh cracks in the roof. Roland says all shows booked for the Durban venue, the first of which was planned for early February next year, will be moved to another temporary venue, to be announced by mid-January. “Please note that the Rhumbelow theatre in Durban is not closing down,” Roland posted on his Facebook page after rumour had spread… and someone had even contacted him to hear he might be emigrating. “I am not going anywhere – other than on a cruise holiday which will see me back on January 16,” he adds. “We have been running the theatre at the Rhumbelow Moth Hall for some 16-and-a-half years. We will, for audience safety, need to fix/replace the entire roof structure. If anyone is in a position to make any donations towards this cause, please email me on roland@stansell.za.net.